Should the foods you eat also be used to feed your skin? That's the premise behind BeFine Food Skincare. Florence Sender, the founder of BeFine Skincare, says that "the same foods that are good for you to eat are good for your skin." I've had the opportunity to try their Daily Moisturizer & I also received some samples that I am still testing. I tend to have dry skin, so moisturizing is a big issue for me. Right off the bat I have to say that I have fragrance allergies, as well other allergies, but the smell of this product was very mild & I had no problems with it at all. That was a huge bonus! Naturally, the next step, after smelling it, was to slather it on. It felt great on & since it's made from foods we eat, my skin had no adverse reactions at all. This morning, my face still felt smooth & moisturized. 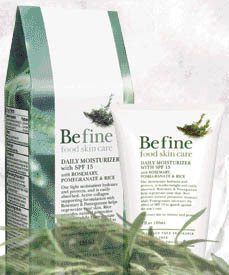 So, if you have fragrance & chemical sensitivities, BeFine Food Skincare is definitely a good option for you. And what if you don't have sensitivities? It's still a good option. Goodness knows how we must be poisoning ourselves with chemicals! Do yourself a favor, don't poison your skin, feed it!